Chances are, there’ll be a great deal of thought going in to your Christmas dinner (and accompanying alcohol). But what about that snack-y stuff that we live on as soon as the party season gets going? There’s not much crisp and wine pairing going on now is there? Something that needs addressing pronto, given the social interactions that take place over a tortilla chip and a glass of the good stuff. A quick straw poll around the office reveals our top festive nibbles and more crucially, which wines you’re going to wash them down with. Whether your go-to tortilla chip is fiery, cheesy or just plain cool, you’re going to need a glass of crisp white wine to get the juices flowing. 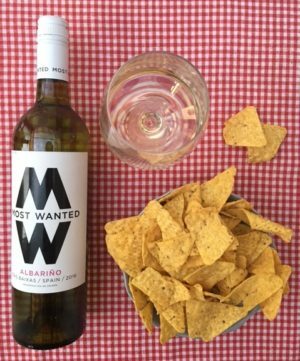 Albarino has loads of SOFT/PEACHY/MOUTH-WATERING flavours – something that makes it great with spicy foods. It might also make you want to eat more crisps, in which case just add guacamole for one of your five-a-day. Love ’em or hate ’em, you’re bound to find yourself confronted by a bowl of these yeasty snacks at some point during December. So how do you deal with that strong marmite-y taste? Just add wine. We think Malbec has enough RICH FRUIT/PEPPER/SPICE to keep those flavourful twigs in line. These made the cut purely because our CEO buys his own weight in them every Christmas. Let’s address the cheese head on. We’re pretty sure most of you would grab your nearest bottle of red when faced with the fromage. How about shaking things up a bit with a fruity white? Our Sauvignon Blanc has lots of RIPE/TROPICAL/JUICY fruit that’ll work the room with any cheese flavoured nibble. It might not be top of your list of Christmas treats, but there’s no better flavour match than a ripe, fruity red with anything that contains a) salt and b) pork. Pinot Noir is lighter than your average red, but makes up for all that daintiness with plenty of CHERRY/PLUM/OAKY flavours. And if you find the odd hairy scratching, you’ll need a sip of something pretty quick. A versatile nibble with universal appeal needs a wine with the same ‘can-do’ attitude. Hence why we’re loving the breadstick and lightly sparkling Pinot Grigio combo – in a can of course (like there’s another way). If you like Prosecco then you’ll love Pinot Grigio fizz, with its LIGHT/FRESH/FRUITY vibe. And you can even hold both in the same hand. Now that’s what we call multi-tasking. Just don’t poke your eye out as you take a sip.